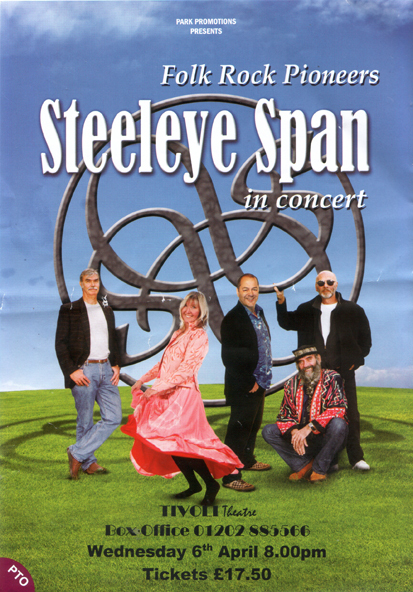 The last night of the “Now We Are Six Tour.” Steeleye Span is a revolving doors band, and it’s hard to say what constitutes an original member. Most would insist on Maddy Prior’s presence, as the only one going back to 1971. Peter Knight and Rick Kemp have been in so long and on such major back catalogue, that I’d say them too. All three were there. “Now We Are Six” comprised the first half of the set. The policy of presenting a whole album intact has issues. Maddy, Peter and Rick all mentioned them. Maddy said there would be some very “interesting” moments to come. Rick Kemp said Edwyn had a VERY 70s intro and outro. Peter mentioned being covered with tons of money and indulgent levels of studio time to record the original. The trouble with the whole album concert is you have to play stuff you chose not to play, even at the time when it was fresh. You also have problems with running order … in this case doing the best-known track, Thomas The Rhymer, mid-set. For me there was another issue: lots of Peter Knight fiddle, but no lead vocals. His two lead vocals in the second half were outstanding, showing what was missing. I’ll admit it, back in the day, I actively disliked “Now We Are Six” and would have chosen the populist Mike Batt-produced “All Around My Hat” LP as the whole album one. But that puts their perennial encore, All Around My Hat, two-thirds through the set. But that’s what they chose to do, with three of the original six, and no synths, no David Bowie on sax, and no kiddie choirs. It was my first time in the Tivoli balcony rather than downstairs, and up there the sound echoed. Instantly, I felt either Maddy’s mic was 10% too quiet or the band 10% too loud. I think the latter. When Peter Knight or Rick Kemp sang, the balance was better, probably because there was one instrument less, or maybe one instrument quieter. They were drowning Maddy slightly throughout, at least in the balcony. Bad move. She’s the key feature. I want to hear the words too. Steeleye Span became progressively more electric, certainly by “All Around My Hat” and here that more electric sound was put back on “Now We Are Six” songs. They can rock. Rick Kemp is an innovative bass player. I’d never realized how good he is before. New member Julian Littman was outstanding on guitar and vocal. In the interval, Maddy Prior stayed at the side of the stage, selling raffle tickets to help Martin Carthy who is unable to work due to the illness of his wife, Norma Waterson. Not many legendary singers would be doing that. I thought them better in the second half (but I’m not fond of “Now We Are Six”). Having seen The Decemberists and The Unthanks (twice) in the last month didn’t help my overall view. When you see a band at their creative peak (Decemberists, Unthanks), and on the way up, it’s so much better than watching the veterans (Steeleye Span), even if they are singing and playing brilliantly as indeed they were) It’s still the “fresh” stuff of 35 years ago. The elderly audience paid little attention to the concession stand on the way out. A shame. At Unthanks and Decemberists shows people were struggling to buy stuff.